I love pasta in any shape or form and will rarely say no to it. However, if I had to choose Red or White sauce, then I will always choose White! Are you team Red or White?? 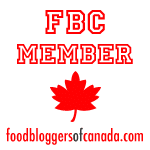 With all my love for creamy white pasta sauce, it rarely happens in my kitchen. My husband strongly prefers tomato-based pasta sauce. 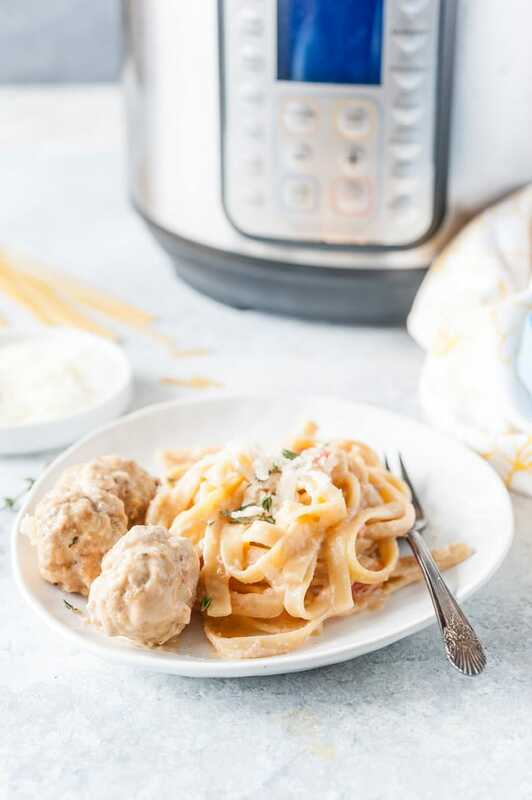 So, in this recipe for Instant Pot Creamy Pasta and Meatballs, I added a little bit of tomatoes into a creamy sauce to satisfy my husband’s tomato requirements. 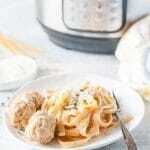 The result is a luscious creamy pasta with juicy chicken meatballs. It’s all made together in Instant Pot, so it’s an easy weeknight meal. 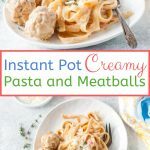 Why make Creamy Pasta and Meatballs in Instant Pot? There seem to be two different opinions in terms of Instant Pot Pasta. Some say that it tastes weird and some love it. I actually do not taste a difference between pasta cooked in Instant Pot or pasta cooked on the stove. 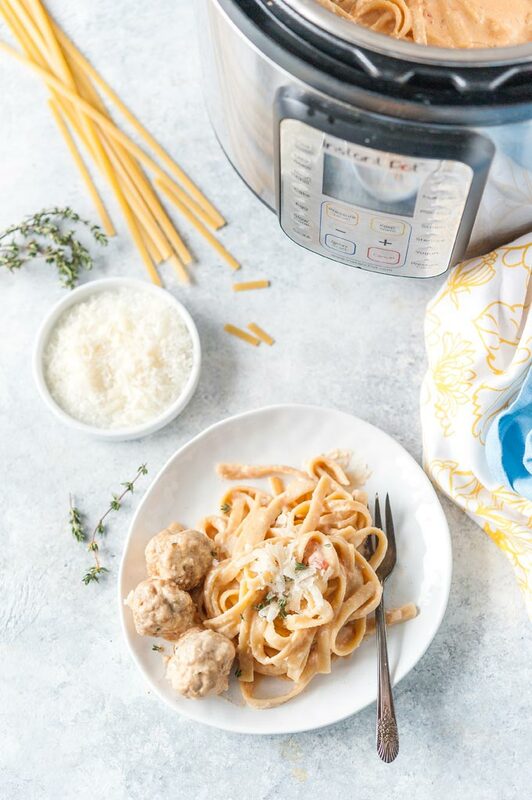 What I love about making Instant Pot Pasta is that everything is made in one pot and I do not have to wait for the water to boil, do any kind of stirring, or draining. There’s also less cleanup and less hand-on cooking time. I don’t have to watch the sauce while it cooks. I don’t have to make sure that pasta doesn’t overboil. 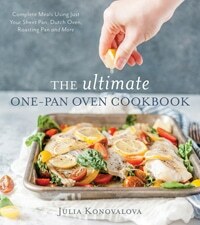 It is just so much more convenient and easy to put everything into one pot and let it be. You don’t need anything too fancy and most ingredients are already in your pantry or fridge. 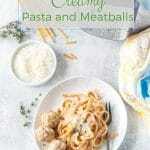 Making chicken meatballs for the Creamy Pasta and Meatballs recipe is actually super easy. Combine the chicken thighs, seasonings, and breadcrumbs in a small food processor. I use an older version of this set. I’ve had it for over 10 years and it still works great. Blitz until the mixture is well mixed. It doesn’t have to be super smooth. Whenever I cook in my Instant Pot, I love using as few steps as possible, so very often I don’t sauté or brown to save a step. But in this particular recipe, it is really nice to actually brown the meatballs. So, first you start by browning the meatballs on sauté mode in a little bit of oil. Turn them a couple of times. Then add a splash of chicken broth and scrape, scrape, scrape to deglaze the pot. If you skip this step, then Instant Pot may give you a burn notice. My model doesn’t display burn but one time when I forgot to deglaze for this recipe, it didn’t come to pressure. Everything still cooked great but pressure wasn’t achieved fully. Once deglazed, add the onion, garlic, thyme, tomatoes, and cream cheese on top of the meatballs. Add the pasta, pour the broth and milk over and cook on high pressure for 5 minutes. Do a 2 minutes natural pressure release and then finish with a quick release. Mix everything together, add the cheese and cook on sauté for another 5-7 minutes to thicken. 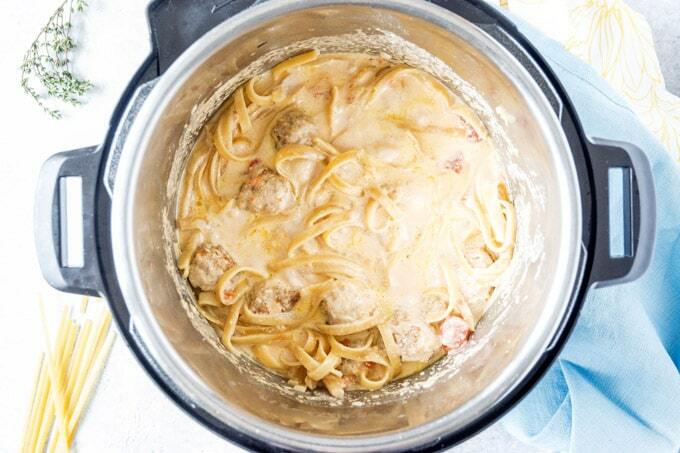 Can you actually cook with milk in Instant Pot? I get this question a lot! People either plainly state that my recipes will never work because I cook with milk (spoiler alert: every recipe is tested on average 3 times, often more before I publish it, so they actually work!!) or other people ask how could it work if I cook with milk. If milk is the only liquid then it could (not necessarily as it all depends on your model of Instant Pot) burn. In most my recipes where I use milk, I also use broth, so milk is diluted enough that it does not burn. If Pot in Pot method of cooking is used, then milk sometimes bubbles out of the container. This is not an issue in this particular recipe but it could easily be mitigated by using a taller insert. And finally, when milk is heated up, it often splits into whey and milk solids, so it looks like it curdled. Curdled milk sounds bad to most people but it actually is the first step in making cheese. So, all those milk solids are essentially one step below ricotta. And in my book, ricotta is perfect in sauces. You can see in the video how the sauce looks right after the lid is opened and after a bit of mixing it gets luscious and smooth. 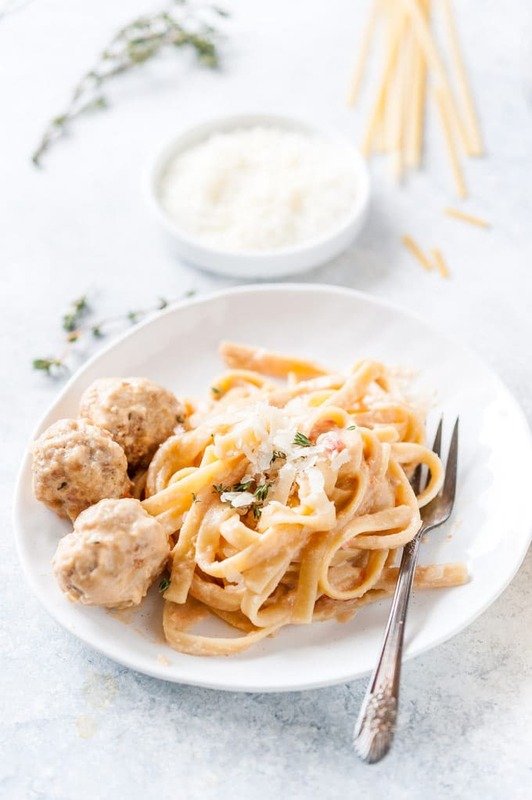 There’s a little bit of prep time as you need to actually measure all the ingredients and make the chicken meatballs but the rest of the meal comes together with almost no hand-on cooking. Let’s say it takes 15 minutes to measure and prep/chop all the ingredients and then roll the meatballs. Add 7 minutes to sauté the meatballs and deglaze the pan. Another 9 minutes for electric pressure cooker to come to pressure. Cooking is only 5 minutes, then 2 minutes of natural pressure release and about 2 more minutes for quick release. Finally, add another 7 minutes on sauté to slightly thicken the sauce. Total time from the moment you start measuring the ingredients to the time the meal is ready to eat is: 47 minutes. Since the sauce thickens as it cools, leftover pasta is not easy to heat up. I do not have a microwave, so the only way to heat it up for me is to add a bit of milk or cream to a wide pan and add pasta to it. You need extra liquid to make it saucy again. 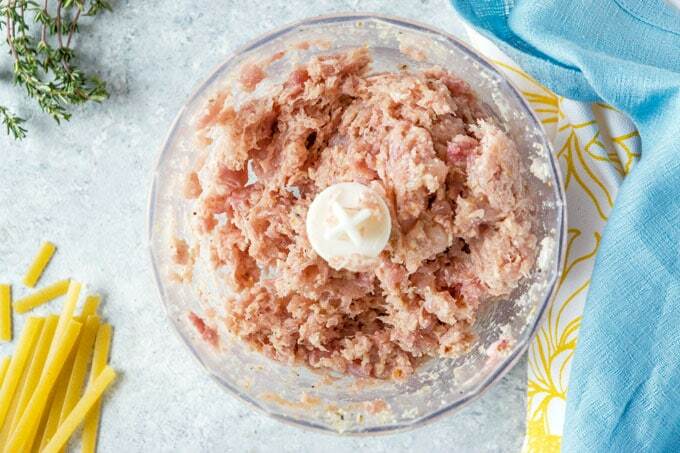 Combine all the ingredients for the chicken meatballs in a small food processor. Pulse a few times until everything is well mixed and blended. It's ok if it's not totally smooth. Press sauté button on your Instant Pot, add the Canola oil and wait until it heats up. The display should read hot. Add the meatballs to the hot Instant Pot and sauté for a couple of minutes on one side and then flip and sauté on another side. You don't need to fully cook the meatballs, just brown them lightly. Splash a little bit of broth into the pan with the meatballs to deglaze the bottom of the pot. Scrape to make sure that none of the bits of meatballs are stuck to the bottom of the pot. Add the chopped onion, minced garlic, fresh thyme, canned diced tomatoes, and cream cheese on top of the meatballs. Season with salt and pepper to taste. I do not add any extra salt at this point because I find there's enough in chicken broth, cream cheese, and mozzarella. 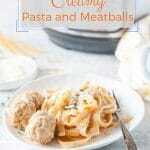 Break the fettuccine noodles in half and spread on top of the vegetables and meatballs. 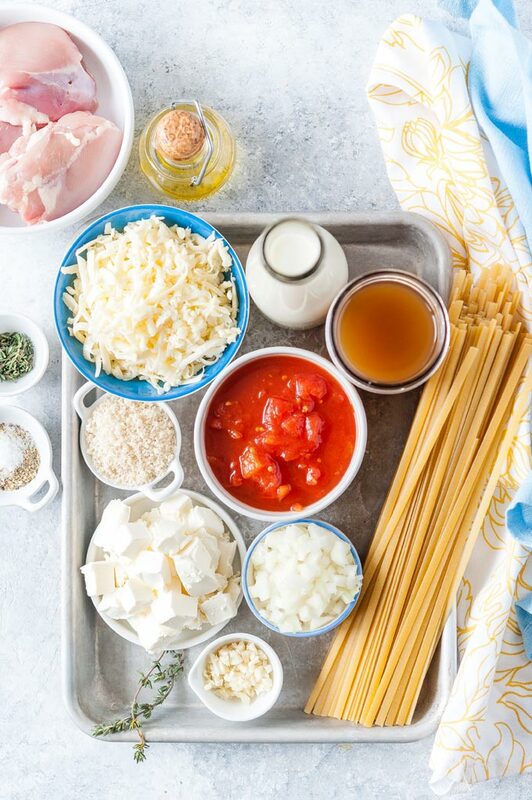 Spread them as much as possible and when you add the second layer of pasta, add it on a diagonal, so that the noodles are criss-crossed. This will help with getting them to cook evenly and not stick. Pour the rest of the chicken broth and milk over noodles. Do not mix. Press Manual or Pressure Cooker button (depending on your model) and use the arrows to select 5 minutes. It should take about 7-9 minutes to come to pressure. Might be a bit less or more depending on your model and the temperature of the ingredients. 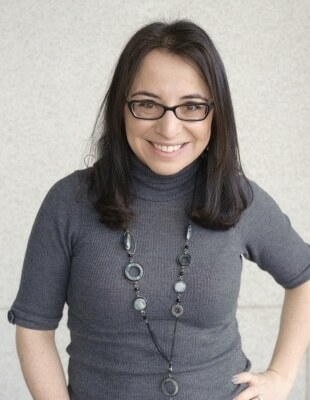 Once the Instant Pot beeps that the 5 minutes of cooking are done, do a natural pressure release for 2 minutes (it means that you need to just wait for 2 minutes). Then do a quick release. This should take another 2 minutes. Carefully open the lid. You'll see that the milk most likely separated into some milk solids. It is totally fine and nothing to worry about!! If you have automatic Keep Warm function, then turn it off. Then turn sauté mode on again. Mix everything well with a spatula or tongs, make sure to separate the noodles that stuck together. Add the shredded mozzarella cheese and cook stirring occasionally for another 5-7 minutes or until the sauce has thickened. Note: the sauce will continue thickening as the pasta cools. Serve with extra fresh thyme and parmesan cheese. The sauce will look a bit too thin but it'll thicken as it cools. You can sauté for longer and reduce it more if you'd like thicker sauce. 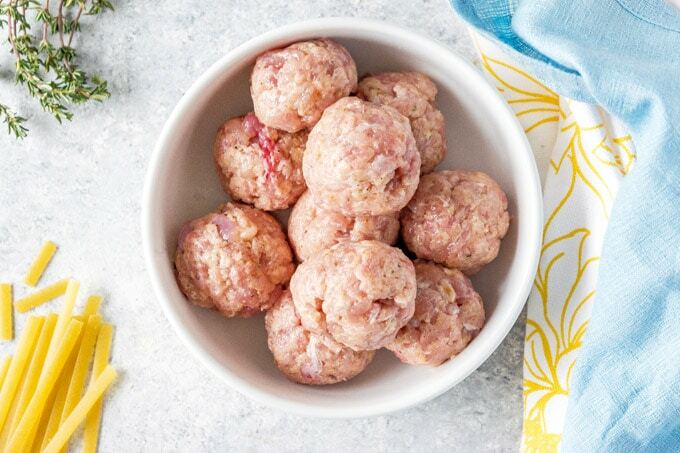 You can use your favourite meatball recipe or even use frozen cooked meatballs.